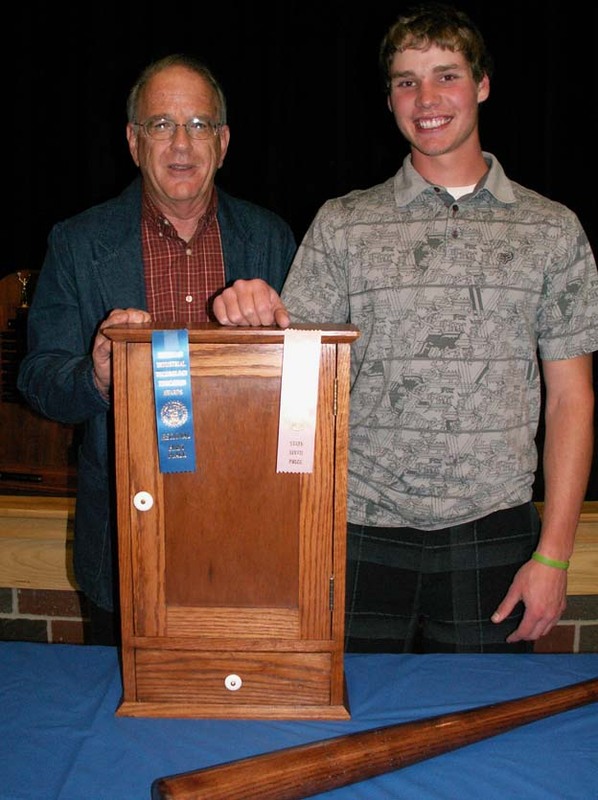 Taking 1st Place in the High School Wood Small Wall Hung Cabinets category at the Michigan Industrial Technology Education Society’s (MITES) Regional Competition held at Fremont High School, was senior Joseph Kosiboski’s project. 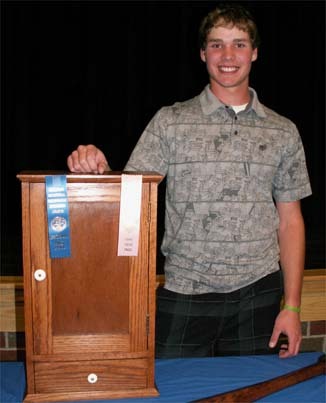 His 1st year Shop Student project was then placed in competition with projects in the same category and class level from all over the State of Michigan. 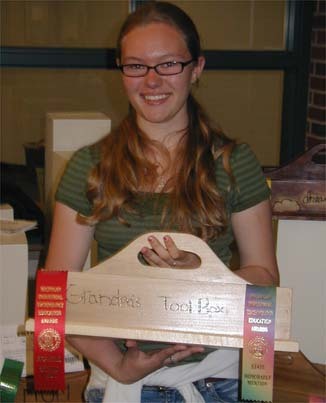 Showing and judging took place at Lake Superior State University in Sault Ste. Marie, May 6th through 8th. With 19 Regions in the state and only the top 4 projects in each category from each region entered in the State Wide Competition, Joe’s project was awarded 6th place out of 25 other “best of the best” projects in the same category. The Onekama Consolidated Schools Shop Teacher, Paul Foster, expects to see more projects of competitive quality produced by the High School and Middle School students in the coming years as the program grows and changes to address the variety of interests brought by students enrolling in Industrial Technology classes. 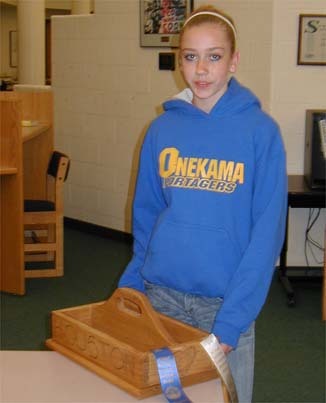 <--Four proud Onekama Middle School Shop students show off their Old Fashioned Tote Box projects that captured 1st through 4th Places at the MITES Regional Competition and 9th Place for Kayla Kosiboski with Honorable Mentions for the others at the MITES State Wide Competition last weekend. Front L-R: Sierra Warner (8th grade), Louise Barnard (7th grade), Haley Maser (8th grade) and Back: Kayla Kosiboski (7th grade). 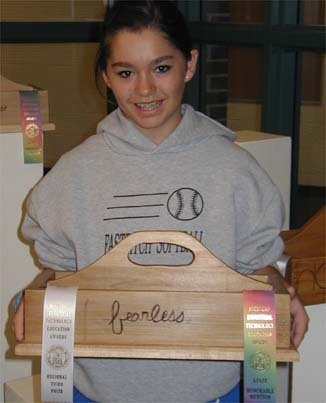 Kayla Kosiboski is the proud winner of the 1st Place ribbon in the MITES Regional competition and 9th Place ribbon in the MITES State Wide competition for her Old Fashioned Tote Box project that features hand-carved hearts at each end of the box. Winning Honorable Mention in the Middle School Division of the MITES State Wide Competition are Sierra Warner, Haley Maser, and Louise Barnard. The projects are made by the students themselves with training and advice from their teacher, all within the limitations of one daily class periods. As the only Middle/High School in Manistee County still offering a general education level shop program in the rural schools, Middle School and High School students have 50 minutes each day for classroom instruction and shop work. 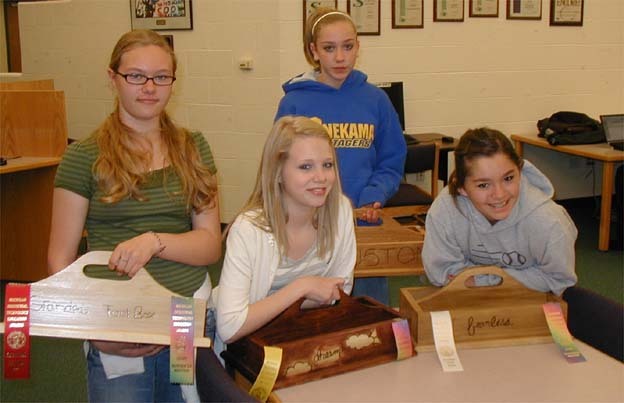 Taking 1st, 2nd, 3rd and 4th places respectively at the MITES Regional Competition for Industrial Technology student projects are Onekama Middle School Shop students Kayla Kosiboski, Sierra Warner, Haley Maser, and Louise Barnard. Their Old Fashioned Small Tote Boxes were completed in the 9 week Shop Class rotation earlier in the year, but also went to Fremont High School on Thursday, April 29th. Having won in the Middle School General Wood Project category, their projects were then placed in the MITES State-Wide Competition on Thursday, May 6th, at LSSU. 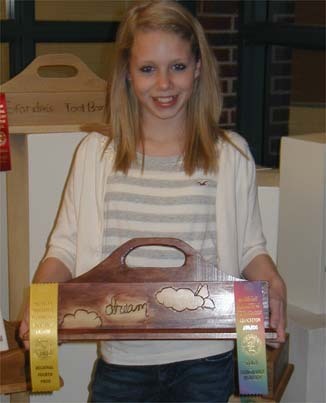 Kayla Kosiboski (no close relation of Joseph Kosiboski) was awarded 9th Place out of 27 other “best of the best” 7th and 8th grade projects in the same category.